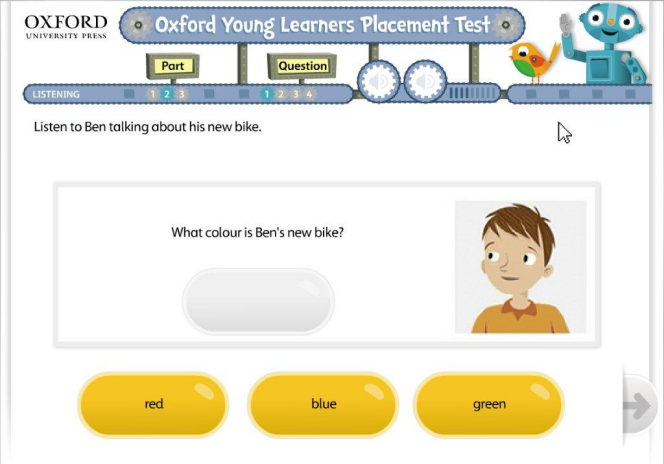 The Oxford Young Learners Placement Test assesses the language ability of young learners online, so you can quickly and reliably place them at the right level or differentiate better between students in a mixed ability class. 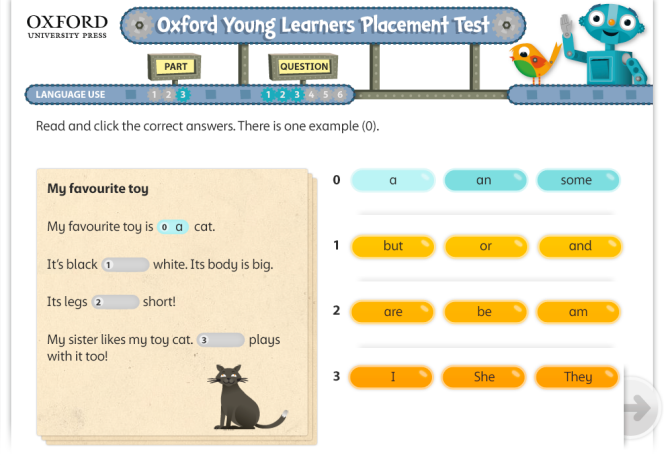 The Language Use section tests vocabulary, functional language and grammar across 18 questions. The questions focus on language use rather than language knowledge, reflecting the communicative language young learners experience in class. The Listening section tests listening for detail and gist, using short and extended listening tasks across 12 questions. The audio automatically plays twice. It takes around 30–40 minutes. The exact timing of the test depends on the questions a student answers. The length of the audio recordings increases with the levels, so higher level students will usually have a longer test than students at lower levels. Students have a fixed amount of time to answer a question before the test automatically moves on to the next question. The test is computer adaptive. This means it adapts to the ability of each student, presenting an easier or more difficult question depending on whether the response to the previous question was right or wrong. So each child is tested at just the right level of challenge. To find a student’s final level, some of the questions the test generates are at the upper limit of their ability. Therefore students are not expected to be able to answer all the higher-level questions correctly. 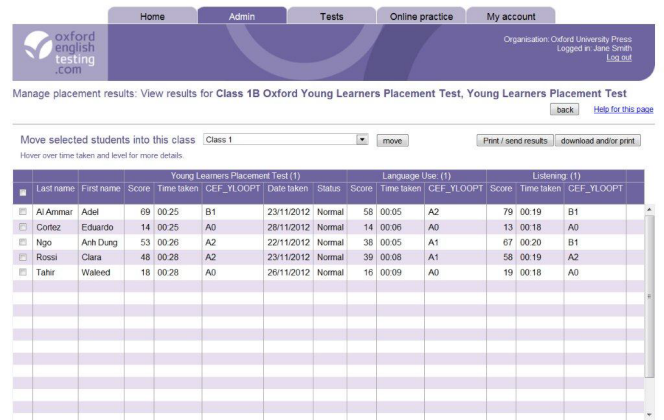 Separate scores are also given for the Language Use section and Listening section, so you can easily identify whether students are stronger or weaker in one of these areas and target your teaching accordingly. Questions are automatically marked and the results are instantly available online. All the scores are shown in one table. You can sort the results in whichever way you want and download them in Excel or print individual Teacher Report Cards to keep a record of students’ results. The placement test’s numerical scores are reported on a scale of 0–80. 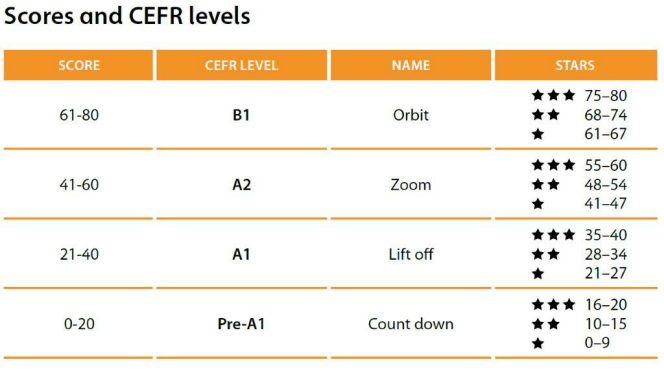 Each score maps to a band of the CEFR. A three-star system at each CEFR level also helps you to differentiate better between borderline students and supports your placement decision. 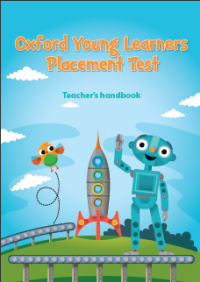 To keep the young learner engaged and confident throughout, the test uses bright colours, learner-friendly images and illustrations. 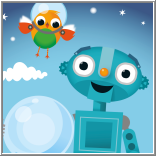 The central characters, Ace and Chirp, appear on every question to guide students. Task types are designed to match the language proficiency and communicative abilities of young learners and reflect tasks they are used to in Primary courses. Questions include real-life child-friendly situations familiar to young learners. Present each student with a personalised photocopiable Student Report Card to take home to their parents, showing their name, CEFR level and club. The test has been written by international young learner assessment experts and pretested by primary school children worldwide. Questions have been reviewed and benchmarked against the CEFR can-do statements and only questions meeting our high validation standards are included in the test. This means you can be confident that it will give an accurate result. Every test question goes through the same validation process before being used in a test to ensure quality, accuracy and reliability. To help you prepare for the test and support you on test day, the downloadable Teacher’s Handbook includes a range of resources. Cut down on your preparation; use our dedicated lesson plan to help students settle down and be ready to take the test. Use the photocopiables and word game ideas to introduce the test. Use the wordsearch and colouring in activities to keep fast finishers engaged. Each club has its own resource sheet in the Teacher’s Handbook with badges, wristbands and desk labels for students to cut out and keep. The user-friendly management tools in the Learning Management System make it easy to administer the test, and to manage the results. You can create different groups for testing and assign the test online, then print a login slip for each student and easily view the results when they have finished the test. Testing vocabulary, functional language and grammar. Testing listening for detail and gist. Save time. You don’t have to do any marking. The system marks an answer as soon as the student goes to the next question. To help you make the right placement decision: CEFR level (Pre-A1 to B1) and numerical score. 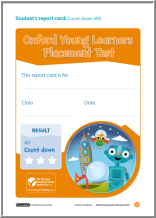 Pretested by young learners worldwide, so you can be confident it will give an accurate result. The test adapts to the student’s answers, taking around 35 minutes to complete so students remain focused. So young learners enjoy a positive testing experience and you get a result you can rely on. User-friendly management tools make it easy to administer the test, and to manage the results. Students can easily log in to the test using a simple number sequence on a printed login slip and short instructions from you. What results does the test provide? How do students take a test? Teachers open the login screen on each computer.